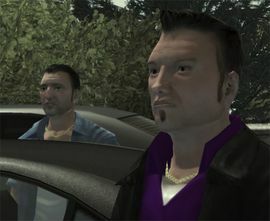 Marco (right) alongside Big Pete during the beginning of "Pegorino's Pride" in GTA IV. Marco Bonnaro is one of James Pegorino's bodyguards during the meet with the Pavano Family in the mission Pegorino's Pride. He is killed by Pavano hitmen, as well as his friend Peter Marchetti. He was generally a friendly character. This page was last modified on 26 October 2013, at 13:51.